Walter Black: This is a picture of Walter Black, a hopelessly depressed individual. Somewhere inside him is a man who fell in love. Who started a family. Who ran a successful company. That man has gone missing. No matter what he's tried, and he's tried everything, Walter can't seem to bring him back. It's as if he's died, but hasn't had the good sense to take his body with him. So mostly what he does is sleep. Wow, this is an odd movie. Well, kudos for the originality and the ability, I assume, to keep most people tuned to the screen for the hour-and-a-half. I think the lure of the film is it gets you involved to the point where you just have to find out how all this insanity is going to wind up although - except for one shocking twist - it's fairly predictable. 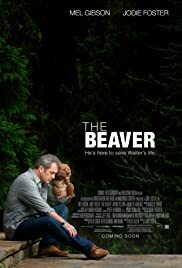 In fact, the film becomes very close to being a "movie of the week" or Lifetime -TV stage, but Gibson's character and the great dialog and voice of "The Beaver" (Gibson sounding exactly like Ray Winstone), snaps it back to a story that re-grabs your attention, time after time, with the darkness of mental illness. Gibson is great as "Walter Black" and Jodie Foster and the rest of the cast hold their own in here. The film is worth a look; just don't take it seriously as some treatise on depression. It does have some dark, scary moments in between the comedy and melodrama. It's unique in that aspect.